Looking for something a little different for Scotland this year? How about a cruise down the Caledonian canal? Get off the tourist track and see things from a different point of view. Save the date (dates open June 1st through Sept 6th) for a luxury cruise on the small ship, Lord of the Glen. This is an expedition/adventure tour, meaning that there are kayaking, guided walks, and biking opportunities included in the price of your cruise. You'll have bus tours of Iona, Skye, and see the imposing Duart Castle on the Isle of Mull. How about a drink in The Old Forge, the most remote pub in the British Isles? Neptunes Staircase Locks are a gem that most tourists will never see, let alone experience, as you will on this incredible tour. This cruise is packed with unique opportunites that most travelers to Scotland will miss. 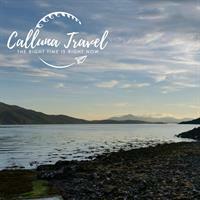 A few favorites such as Inverness, Culloden Battlefield, the Clava Cairns, and Loch Ness are also included in this beautiful itinerary. A visit to Scotland wouldn't be the same without spending some time with familar friends. Price per person is $7990 (air not included). This is a steal for an in-depth luxury tour through the heart of this amazing country. Contact me today to book this one of kind cruise.